Well, it is almost midnight...March is over. 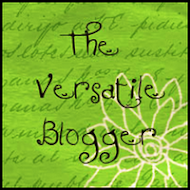 April A to Z Challenge is about to happen! I am doing a poem for each letter of the alphabet plus a little extra challenge has been added to it. This is not unlike my saga with the necklace! I finally got the little dangles done and put some super glue on the knot to keep it secure. Guess what happens next. Well, liquid super glue wicks down the cord gluing all the beads together...and a little of my fingers. Fortunately I got the slow set kind, so I was able to get it off my hands before I became mitten handed. But the beads weren't so lucky. They stuck together, and wiggling them to see if they'd loosen up and not be stiff made the thread break in half. So not good. I went back to The Beadin' Path as quick as my little car could, and bought more beads and a prethreaded needle with silk thread, so the threading of the tiny beads would go more quickly. That was a relief! So it wasn't easy. Had to come up with a new solution for tying them off. But I got 'er done. And it isn't midnight yet! Must get this posted and go to bed! 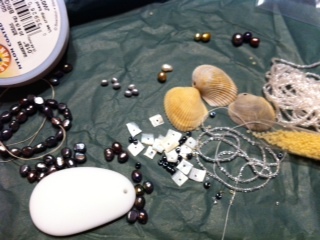 Pearls and Shells and Beads, Oh, My! The necklace is almost finished. I want to lacquer the shell with a satin finish to give it some strength and maybe a little more depth of color. I went out to find some lacquer at WalMart, but I'm not sure I want enough to do a small yacht. Maybe the hobby shop in town will have enough to do an average sized model of a yacht. I'll try there next. 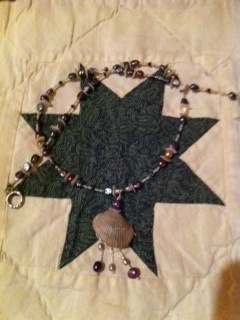 The most difficult part of this was the dangles from the shell. I wanted them to have some movement and strength, so I used doubled heavy duty thread. The beads and thread didn't want to cooperate, at all with each other. The beads kept turning away as I prodded them with the thread, and the thread kept splitting back into its two parts as I tried jamming it into the almost big enough holes. There was much sighing, groaning, squinting, pursing of lips, tongue biting and shaking of hands. All of these things eventually worked when I did them just right, as I finally got the beads strung onto the thread. 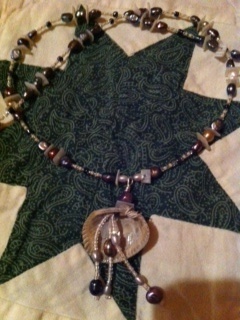 Now I have to figure out how to attach the dangles to the shell, and the shell to the necklace. I have never attached thread to metal wire, and it's taking me too long to figure it out. I'm sure there's an easy way to accomplish this, and fast, too. It's just going to take me way into eternity to figure out what the fast and easy way is. Maybe I need a trip to The Beadin' Path in Freeport. They always have good ideas there. A trip there though, usually means I'm going to spend money. I don't know how it happens. 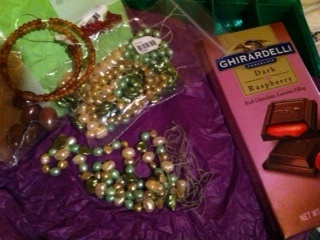 Just suddenly (after an hour) I'm walking out the door with one of their little green or lavender bags with goodies all neatly wrapped in green or lavender tissue paper and a big grin on my face, scooting off to the car to hurry home and unwrap my treasures. I'm literally like a kid in a candy store. The good thing is that there are no calories consumed for the same amount of fun as candy is. The bad thing is that I spend more than I would on candy. I've gone three weeks as of Sunday, with no sugar. I think I deserve a trip to my no calorie candy store. Check out other poetry related links at My Juicy Little Universe. 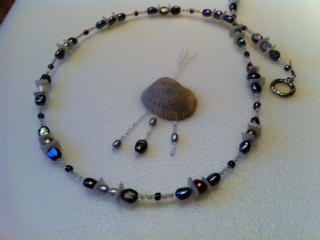 I am taking time out of my day today to make a necklace. Here's what I have to work with. The three shells on the right are hand-picked by my grandniece in Arkansas (though I believe she picked them up off a beach in Florida when they lived there). She is two years old, and gave the shells to her grandmother, my sister-in-law, who would like to have them made into a necklace. I really need to clean off my table and vacuum and put in the laundry and make the bed (good grief, I didn't even do that) and go grocery shopping. But instead I'm sitting staring at these beads and shells and pearls and wire and wondering how it is all going to go together to make something for their visit to Arkansas the day after Easter. So I'd better stop typing and get stringing! Oh, and now I'm hungry. I haven't had lunch yet. First bead something, then eat. I will keep you posted. 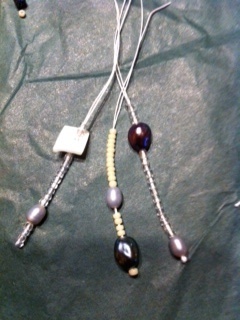 Hopefully with a picture of a completed necklace tomorrow. So far the pile of ingredients is not too appetizing...but we'll see! And many of those things have just happened, so I'm going to take the hint! Good night! I didn't fall asleep at my Post! 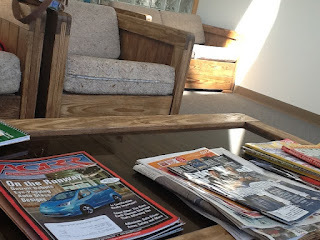 Waiting at the doctor's office. They say the procedure should take about 2 hours. My husband will join me here shortly, most likely before the procedure is completed. I knew there was a problem days ago but I ignored it. Then another symptom that couldn't be ignored. This one was getting worse as the hours went by. It was impossible to ignore any more. It was practically staring me in the face. A quick call to my insurance and the doctor was approved, and the appointment was made. 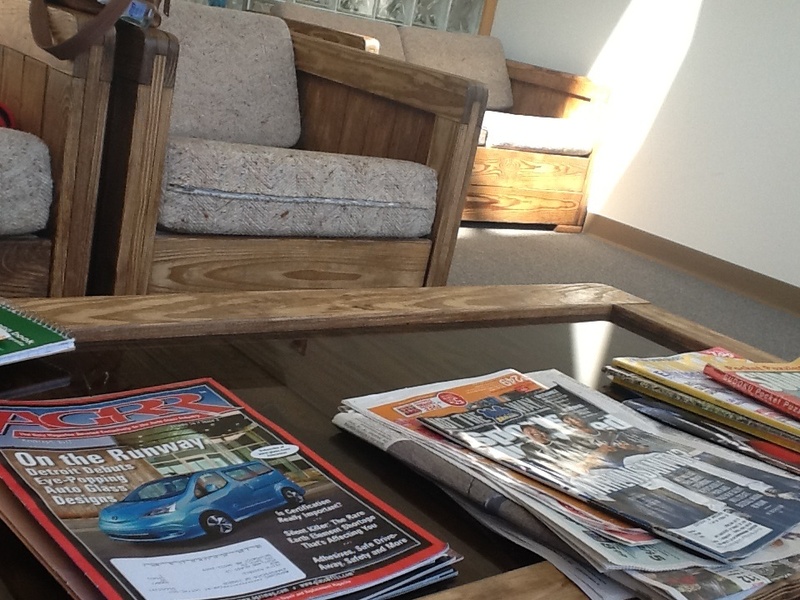 Now I sit in the waiting room strewn with newspapers and magazines. I straighten up the table. The wait seems endless, but I know the outcome will be fine. But two hours later, just as promised, I can see clearly through this new windshield - no more growing crack across my view. I'd seen robins somewhere last week, but not at my house. And I didn't quite see a robin today, but I awoke to the sweet sounds of that harbinger of spring! I wake from the deep. To wake to this sound? 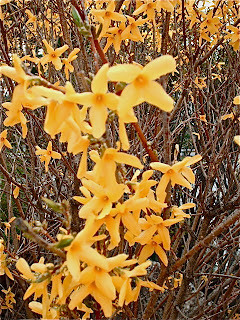 I saw the first forsythias at my sister-in-law's house today. They were all in bloom in a huge bush. I love seeing them. 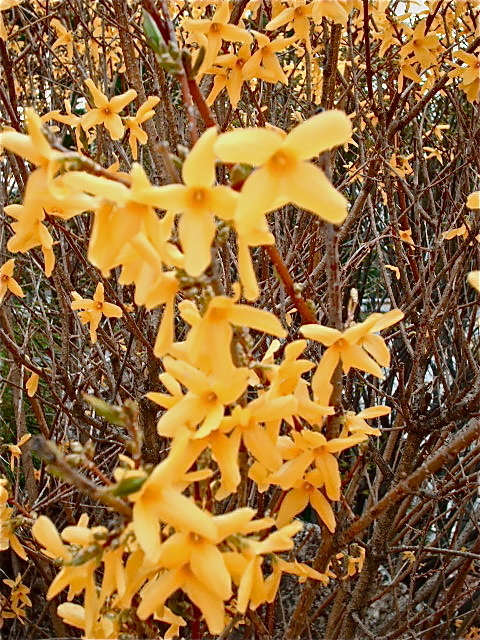 It is truly spring when those balls of yellow starry blossoms appear in yards and along the roadways. I wish they would stay longer! "Do I look like I'm ready for a gun show?" He plops on his favorite Whitefish, Montana cap and stands there in his khaki cargo pants, rust Henley shirt with olive drab short sleeved overshirt and olive drab vest with 100 pockets. His shoulder bag with another 100 pockets is slung over his left shoulder. His blue eyes twinkle and the beard on his chin is as white as the snow. His droll mouth is even drawn up like a bow. We had to get up really early for this. We want to be there before the dealers have all bought from one another to stock their tables and upped the prices. I am a gun owner. My husband is. My son is. My daughter doesn't own one...yet. We enjoy target shooting together. It's a fun family activity we can do together without spending too much money unless you choose to. So when the gun show comes to town in spring, we are there...in case we choose to. But mostly we just look around, buying only when something looks like a good deal. There's usually something there to catch the eye, even if it's just a new case. This is a big event here and draws lots of people: men and women; and families with well behaved kids who don't touch, don't whine, don't have to be carried, and aren't sticky. For some reason they know how to behave here, or maybe these are the parents that have it figured out. Every available piece of real estate is sporting a pickup truck and every truck is adorned with a plethora of bumper stickers - great bumper stickers proclaiming freedom, pride in America, fairness, love of country, and work ethic. "Your fair share is not in my wallet" seems to be popular here. We walk to the front doors of the Armory and pay before we step out on the paper covered gym floor. Just inside the door a bearded man is bellowing "Breakfast dogs wooo-oooo! Another breakfast dog down! We need more breakfast dogs!". People are buying steamy red hot dogs and piling on the onions and bacon bits to start their day right. We've already had a hearty bagel egg and cheese sandwich at MacDonald's so we're set to go! We start our rounds of the hundreds of tables covered with about anything you can imagine even remotely associated with survival and hunting. My husband has his routine so that he doesn't miss any display or sale...start on the left (is that because he's left handed? Because I'd like to start on the right. ), up the left most table against the wall, back on the other side of the aisle on the second table. Weaving up and down, up and down. The first show I ever went to I looked on both sides of the aisle glancing back and forth in one trip up the aisle. Wrong. I had to go back the way we'd come while he looked on the other side, so I was seeing everything twice....or not at all, according to my husband. I don't think he's right, but evidently the rest of the crowd agrees with him. So I do it his way now. Cute little derringers catch my attention. I don't have one of those yet. Some women must like to be known as girly-girl gun owners. There are enticements obviously meant for the feminine set: bullet replica earrings and necklaces, and camo vests with pink polar fleece. 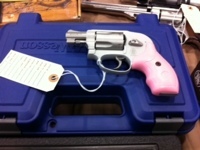 There are pink gripped .22s. A dad's buying one for his daughter that looks like a combat rifle in pink camo...obviously meant to blend in with her Barbie dollhouse. When my back gets tired I find a place to sit down and write, and my husband makes his second trip around to rethink potential purchases. He's seen everything and knows the prices so can now go back and decide whether or not he's making a purchase today. Somehow he always remembers where he saw things and can go right back to the spot. Often that's on a third trip. Usually he comes to find me before the final round begins in case I'm hungry. Really he wants to let me know he hasn't left without me. The excitement of a gun purchase could do that. I reassure him I'm okay and that he can continue to take his time perusing the firearms. 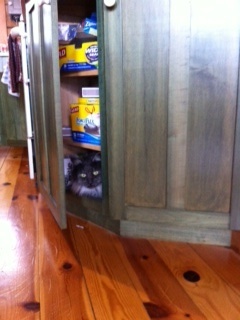 After my writing break, I head back to the floor to see if I can spot him. I'm looking for an over 50's male with white/gray hair and beard with an olive green hat, olive drab shirt and olive drab vest. That narrows the field down to half the crowd. Come into my house, Gretel! “Oh, do come right in, come into my house! We’ll have a great time,” Said fox to the grouse. “No, thank you, dear fox,” grouse had to decline. “Stay here for dinner; sojourn for a while! I’ll make you dessert,” he said with a smile. I had to post my Fox and Grouse poem that was on Think Kid, Think. Partly because we are getting to the time when a couple of years ago in early April, we were befriended by Gretel (though, now I believe it was Hansel really). My husband had gotten out his .22 to sight it in just in back of our house in the woods, and as he was walking along in the damp, brown "leaved overs" of fall covering the ground, carrying the rifle in one hand and some targets in the other, up strutted a brown grouse. 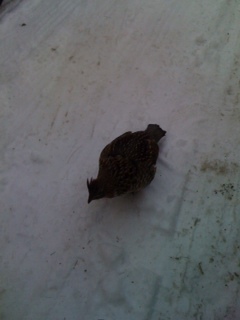 The Ruffed Grouse followed him from the woods to our house. My husband called me out to see what followed him home. She stayed close to his heels wherever he went, and then I found that she would also follow me. She was captivated by my flowing skirt. From that day on, she was like a pet, and we named her Gretel. She was very bold and wanted to come in the house, following us up the steps and to the door. When we'd go in the house she would eventually leave, but wouldn't stray too far. Later she discovered we had a sliding glass door in the back (where someday we'll build a deck). It is a bit high with no steps or deck yet, so she would sit on a fallen tree in the back yard and watch me at the computer at the kitchen table. A couple of times she flew up to the door and tried holding on the the bit of the edge of the door, trying to balance there to get a better look into our world. The cat was mesmerized on the other side of the glass. It was a bit intimidating at times, as she'd ruffle her feathers and stand tall and sometimes peck at your ankles...not too hard...but aggressively at times. If you are my age, it would put you in mind of the Hitchcock movie, "The Birds". As my husband would walk around picking up sticks before mowing the lawn, she would often grab my husband's pant leg and hold on as she got kind of dragged along. It didn't seem to faze her, she'd hang on until she got tired of the game and then she'd let go and run along beside him. And as he drove along on the riding mower, she'd run along behind him. If he was sitting on the rock in the front, she'd get on his lap. We tried to pat her, but that wasn't her thing. So we settled for being followed and having her get on our laps. It was difficult to leave the house sometimes - well, all the time. It got so that I'd try to run to the car if I needed to go somewhere. But she'd appear out of nowhere and hustle right up to your ankles, making it difficult to close the car door safely. As the car would start to move, she'd circle it, and somehow manage to avoid getting run over - we couldn't see her very well as we backed up. Then she'd race off...no, it was more of a waddle-run... behind the departing car. The faster she her short legs moved, the farther out her wings would stretch until she was in flight. 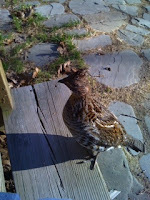 Ruffed Grouse are really neither running, nor flying birds, but she'd do both to stay close to us, ar least for a bit When the car got onto the paved roadway at the end of our gravel driveway, she'd land and stop to wait for our return. Well, we thought she waited anyway. We learned later that if we weren't home, she had discovered that sometimes our neighbor across the road was home doing some gardening in his yard and visited him, too! When we returned though, she was right there to greet us again. The FedEx man still asks about her. It was such an amazing year. She stuck around from the first of April until December. Late in the fall she sustained an injury somehow and had a limp. Probably a fox in the area, as she wasn't too afraid of our Golden Retriever. She probably got lured in for dinner, but escaped that time. She did not return in the spring. I miss her low happy purr, her agitated humming. I still expect her to appear out of the hemlock when I go outside. I miss looking in my rearview mirror and seeing her flying after the car. I hope someday one of her relatives comes to live here. In case you missed it on Think Kid, Think! this was my "losing" poem (no poem is a loser, right? )...but not by THAT much... 95 to 79... and it was such fun! My opponent for this round was a published poet - Susan Taylor Brown, Hugging the Rock - so I'm feeling ok about coming in second out of two. Hope you like the poem...and that this isn't cheating because I didn't write it today. Oh, but I did write this part. You can go there again in a day and vote on some more. I won't be writing, but I'm certainly going to jump in for reading and voting! He mortared and bricked them, some big and some small. But when he had finished, Ed’s stomach was sick! Demented Cement Ed is still there, no doubt. But nevertheless his fate’s been cemented! It seems life has been so full lately, that I don’t know at all what to do with it. While Linda at TeacherDance was working out things in her own life, I had a feeling that there was something wrong. Then she revealed to us the struggles she has had, especially over the past few weeks. I felt a sense of relief that she could at last put it into words. I would like to write about my feelings over the past week, yet I cannot. Maybe I will write them later and not put them up here, I guess, for family privacy. I think there’s a book somewhere in the brain jumbles if my sister and I can get together on it. I'm fairly exploding with the need to write it. I was thankful that the TKT poetry writing was smack dab in the middle of all the past week's events. The competition was somewhat of a distraction while my mind was racing alongside me this week. I guess I can say, because it is on the Internet already, that much of it revolves around the uncertainty of the 23 hours over night that my grandnephew - my sister’s 12 year old grandson - was missing last week. Suffice it to say being overnight with just a sweatshirt for warmth in the Maine woods in a swamp is not the place to be in March. And needless to say there has been much rejoicing in our family, albeit quiet rejoicing, private rejoicing. I have seen the sun come up, and have seen it set. I have seen Jupiter and Venus shining so brightly they seem to be suns sneaking into our solar system. I have written poetry that I liked pretty well, and others seemed to enjoy also - how nice is that? But yesterday and today I have been blessed to be able to spend the days with my grandnephew as he heals from hypothermia and frostbite. I can’t really write about it much. I just have found the experience to be a delight and a privilege to spend time with him talking, playing video games, and reading poetry (and forcing him to drink liters of water) in his recovery mode. It has been a wonderful two days. Busy writing, busy reading, busy sitting, busy thinking. Busy, busy, busy as I sit watching him heal. It’s been busy and emotional, but in such a good way. Make sure you stop by to do your "required daily reading" of poetry at Think Kid, Think! And VOTE! 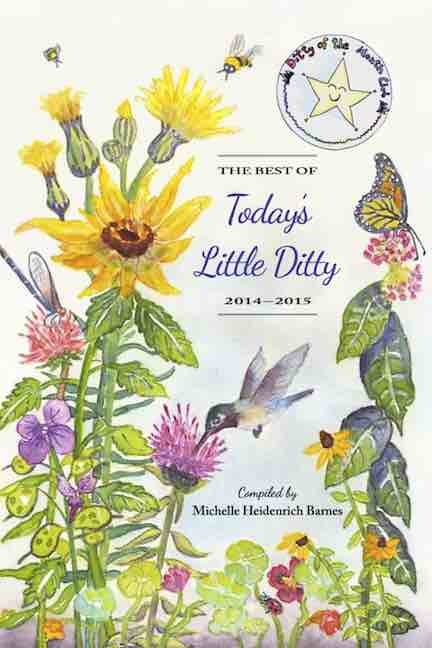 It's a plethora of poetry for you today! Enjoy! BTW: My word is "cement"...and my opponent's is "translucent". Voting closes tonight. You might get your students involved and let them do some voting (you need a different IP address for each voter though) or take a class tally before you cast a vote! This competition is lots of fun and there are lots of kid appropriate poems being created in a short time by published and unpublished poets. Why even Jane Yolen was here! She was out on the first round...but she was here! All poems should be written for the 7 to 15 year old age bracket. The poets have 36 hours to write a poem using the one word they are assigned...a form of the word is not okay. For example, my word was cement, so the word Cement is there, as well as cemented. After the poem is written, and both are received, the poem is posted and there are 36 hours for voting. All the rules and guidelines for voting are on each match's page. So go on over and take a peak! It's all in good fun for everyone. And although the poets there would say it's just a friendly competition...you just know they'd like to win! I wrote a speedy poem for TKT today. Poems for this round are being put up today at various times and each has a 36 hr. 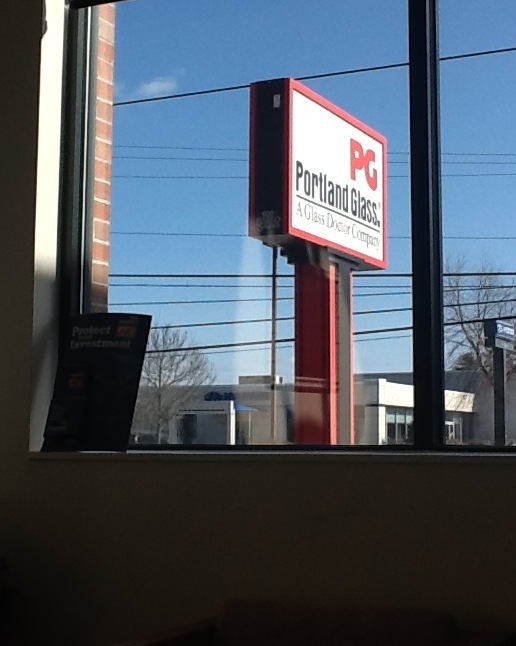 window for voting. Make sure you stop by to do your "required daily reading" there! And VOTE! It's a plethora of poetry for you today! Enjoy! BTW: My word is "cement"...and my opponent's is "translucent". I'm thinking translucent is going to make a more delicately worded poem than cement! We'll see! For good times that outweigh the bad. And prayed down the blessings we had. Our heartache has been washed away. "Thank you" is all I can say. Do you know WOOT? They have deals each day in a few categories. It's worth checking today for those of you who like to read. (there may be one or two of you.) I have the WOOT app on my phone so I can see it easily every day.out. Check WOOT Shirt today. It's a READ t-shirt! You might be interested in a fun shirt to wear. It's only available today until it sells out. Woot.com. Check it out. I have a poem to write sometime by tomorrow morning, so this is about all I can muster for a post! But it's a pretty good one! When my son was 5 years old, he wanted to learn to ride his two-wheeler. He had zoomed around on his green plastic three wheeled GI Joe trike for two years. He had a blue race car with four wheels that he pushed around with his legs since he was 2. He had a bright green and yellow John Deere tractor that he got for Christmas one year. But now he was the proud owner of a shiny silver gray bicycle. And only two (count 'em) wheels. We had a gravel driveway that was pretty level, out in the country parts of RI, just a few miles to the right of Connecticut. So, being the good mother that I was, I proceeded to do what I'd seen all parents do to teach their child to ride. I held the handle bars so he could get on. Then I held the bike up, running by his side while he pedaled madly down our driveway, over rocks and lumps of grass and into and out of holes - none of which I had ever noticed before in such detail. I transitioned to holding onto the back seat and ran bent over halfway keeping the bike up and on track as best I could. We did that quite a few times before I did the surprise parental 'let go'. You know, the one where the child just starts riding, and looks back to see that no one is holding on. Only every time I did that, he would veer off onto the side of the driveway, ending in a bush or tipping over and landing on his side somewhere on the lawn. Looking back, I'm not sure how many times we tried this. It was a bit like me and golf. After 10 swings on one hole, I stop counting. And I do remember at one point my son getting up off the ground, picking up his downed bike, and without looking at me, wheeling his bike past me on his way back to the garage. He carefully parked the new bike against the wall beside the car. "Are you done for today?" I asked at him, knowing he must be exhausted - I was. "I am not going to do that until I know how to do it!" he stated matter-of-factly. BTW: Thank you to all who voted in the Think Kid, Think poetry matches! It was so much fun, and there are so many good poems to read. I made it through round 1, and am on to round 2 shortly. I will get my next word tomorrow night. I'll have 36 hours to write another piece...then voting starts again. Some are getting their words tonight and will be posting those Sunday morning. So make sure you go back to (or go to if you didn't yet) Ed DeCaria's site to read more great poetry and vote some more in a couple of days! I am doing the Think Kid, Think poetry challenge starting yesterday. You have to visit Ed DeCaria's site! There are some great original poems being created in sessions of 36 hours. Enjoy reading them, and then voting on your favorites. I had the word "sojourn", and wrote two poems: one I've posted here on the TKT site for the challenge/contest, and the "leftover poem" I decided to post here for my Poetry Friday and the March SOL Challenge... so it's a multipurpose poem! This one lent itself to literacy, plus it was a giant slice of my day Wednesday, writing poetry and sitting inside on a very snowy day. Remember how I said you had to keep an eye and ear out for the weather report? 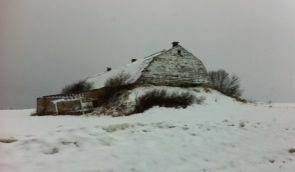 Well, it snowed from Tuesday early evening until early Thursday morning up in Aroostook County. All I can say is it's a good thing we didn't HAVE to leave yesterday. We could sojourn a while longer! People and places of interest to me? Sojourn or journey? Which to embrace? And see all the sights, with a book in my face! Remember again to check out TKT the main scoreboard for many fine poems written with time and word constraints. Look at the guidelines for voting, and then dive in for some fun! Being up here in Mapleton, Maine, has brought back another memory of a trip out here. This time I was teaching first grade in Wisconsin. I shared a huge room in the Library-Media Center, with a reading specialist and another first grade class. It was back in the 70s, so the thing to do back then was to teach without walls interfering with your ability to span the curriculum across acres of kids so no one could pay attention. Although there were no walls, teachers spent hours making sure they had the right furniture to create walls and pathways for other classes to weave through their room on the way back from Specialists. My student teaching was done in a school in Hampden, Maine, that had 4 third grades in one huge room with room dividers that could be slid back to open 2, 3 or 4 rooms up to share a lesson. It was a strange time, the 70’s. 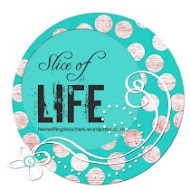 The teacher I shared my space with in LaCrosse, Wisconsin, was young, as was I. I had been married for 5 years, and she had been married for almost a year. We had a great time teaching together, laughing, talking, supporting each other in our failures and applauding each other’s successes. We worked very well together, and it really didn’t matter that we could hear every word the other spoke as we taught our two classes side by side. It actually helped in some ways. We’d be reminded of things we wanted to remember to do or say. We could watch the other class if we needed a bathroom break. We could reassure with a look to the other, if we wondered if we were being either too harsh or too easy on a student. I remember nodding approval to her as she spoke to a student about some inappropriate behavior. We just had a good way of communicating and helping each other even without words many times. At the end of the school year, I wanted to go home and visit my parents and in-laws in Maine. My husband’s job couldn’t give him any time off, so I talked my teacher friend into driving the 1600 miles to Maine. I decided that going through Canada, as my husband and I had done before, would be the easiest way to go. That way we would come in at the north to see my in-laws first. We’d come into Maine that way and then travel downstate to my parents’ home. Then we’d return to Wisconsin through the states. We set out for our journey, packing backpacks with clothes and the usual necessities. Then we packed a basket with some snacks, and plastic bags of instant coffee, sugar and creamer. That way we could stay awake for the 24 hours it would take to make the journey. This was before you needed a passport, or birth certificate to get across the border. You had to stop at a check point on the border and declare why you were traveling and show your driver’s license. Then you crossed the border, and tah-dah, you were in. We traveled through Michigan and then took a route through Canada up to Northern Maine. We would have taken the route through Sault Ste Marie, but my husband and I had done that one before, and there really was a long stretch there where there was nothing. No restaurants, no motels, no gas stations. Well, there were some of those places, theoretically. Or at least that’s what their hand painted signs said they were. So we didn’t go that way. Two women traveling alone, before cellphones, it wasn’t a great thing to do. So we traveled to Detroit and crossed over to Canada there. We drove and drove and drove. We came to the Canadian/US border to get back into the United States well after midnight. We were very tired, and getting slap-happy, as it was exciting to find ourselves within a couple of hours of being at our journey’s end. Their was only one guard at the US Border that we could see. He looked at us and assessed the situation. He asked where we were going, and then were we going to meet any one here. That seemed a funny question to ask us, so we laughed and told him where we were going to see my in-laws in Mapleton, and no we weren’t meeting anyone here at the border. He asked us to get out of the car, and we obliged. No sooner had we gotten out of the car, than a young man appeared out of the darkness and walked up to us. He asked if we would give him a ride. We said "No". He walked back into the night, and we never saw him again. When he was gone, we began giggling again at the coincidence of being asked if we were meeting someone, and then someone appearing as if we were waiting for him. At that point, the Border patrol officer began pulling our car apart. Every item we owned was removed from the car. Backpacks were emptied. Because, as I said, we were tired and getting giddy, we sat down on the curb in view of the Border Patrol, and started to giggle even harder, as we remembered the basket of snacks, and bags of coffee, sugar and creamer on the floor of the back seat. What would he think of those plastic baggies of white powder neatly tucked under the coffee? We laughed even more, until we realized we could be here for quite a long time while they tested both us and the sugar and creamer. After all, it was in the days of drugs crossing the northern borders of Maine...oh, dear! What were we thinking? But we still couldn’t help but laugh at the circumstances, and what they would say when they found out the white powders were for coffee highs. Suddenly, in the middle of his pawing through our purses, he stopped. He had concluded his search and found us to be harmless, young teachers. Although he didn’t help us repack, we got to return to the USA, and got to keep our sugar and creamer, and our pens and pencils. I am up north. Way up north. North in Maine. So that's north a lot. This is potato country in Maine. It's a land of sky and potato fields. It's a land of hardworking people. It's a cold, frozen land in the winter, and in much of the fall and spring. The snows in Southern Maine have pretty much gone. 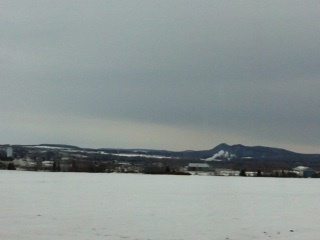 But in The County, as Aroostook is called, it is still snow covered. Today on our way up, we could see Mount Katahdin clearly. Often it is cloud covered and barely visible. But today its peak was pristine white surrounded by dark spruce and pine at its base. It put me in mind of barnacles - but then I am from the coast. We wanted to stop for a picture, but the lookout road was snowcovered and closed. Some footprints led up to the overlook. Earlier someone had decided to park their car on the side of the highway and hike up to get a better look. We decided not to risk the ticket. We've seen the mountain before. I still like to see it though. It is like looking at the ocean that changes with the sky and seasons - never the same view from day to day. We kept on riding. Pippi came with us. She, unlike Deb Day's Chloe, got to come on this trip. (The cat is not going to be speaking to us when we get back.) Pippi is a good rider and doesn't need to have a bathroom break during our 6 hours on the road. This is fortunate, as I really don't like picking up dog droppings. We, however, needed to stop twice. Coffee, bathroom, Monster drink/orange juice, bathroom, no more drinks, no more places to stop, we're there, bathroom. After being on the road for 6 hours we arrived at our destination: Mapleton, north of Presque Isle, west of Canada, a nice little town, and the town where I first taught school, and where my mother-in-law lives on her own in her cozy home of 60 something years. We came for a visit to relax, get the computer working correctly again, watch TV, sit a bit, and talk. We may play Bananagrams, a game we found at BAMS! on our way up. And tomorrow, for supper, we'll have the sockeye salmon that we bought and packed in ice for the trip. Time to head home will come too soon. It's a long ride. It's a long time between trips. The summer is really the time to do this. The weather at any other time is too unpredictable. The whole time we are planning the trip and the entire time we are here, we keep an eye on the weather. Snow flurries on their way today. I remember a time, years ago, when we left Mapleton to go home after Thanksgiving, a few snowflakes had started to fall. My father-in-law said it wouldn't amount to anything. It was just a flurry. It would stop very soon. I looked at the sky, and wasn't so sure about that. But because we needed to be back for work the next day, we headed for home in the "flurries". We never did get out of the storm. It was not a flurry. You don't need a yardstick to measure flurries. You don't need to shovel and plow flurries. This required shoveling and plowing. This was measurable in feet. This required x-ray vision and snowshoes. Cars and tow trucks littered the highway and embankments. We arrived home safe and sound in body, but mentally a wreck. So we are keeping an eye and ear out when the weatherman speaks for the next few days. We will plan our trip home accordingly. I was reminded of a “word”, of sorts yesterday. My brother asked me if I remembered the most beautiful word in the English language. He said I had told him many years ago when we were children...so that was a lot of years ago. He remembers everything about our childhood years. I couldn’t remember, until he reminded me: cellardoor. Yes, now I remember saying that. Technically that isn’t a word; it’s two words. But I was a kid. We said it as one word, like football, mailbox...a compound word. But I’d never written it, nor asked anyone how to spell it. So if I’d written it, I’d have probably not even spelled “cellar” correctly. Say the word softly, running the two words together. Make sure the primary emphasis is on “door” and the secondary one is on the first syllable. Got it. Now do it. Isn’t it just about the prettiest word you have ever said or heard? Well, I thought so. And as soon as he said it, I was brought back to a time long ago in our old kitchen in Woolwich, Maine, on our 10 acre “farm”. I was reminded of why I probably was even saying the word. The cellar door was the spot we recorded our heights every year or so. All four of the D’s lined up with heels snug to the wall while Mom made that line pressing down on the tops of our heads. Then we’d step forward with grins of anticipation, looking to see how many feet taller we’d grown that year. Sometimes during the day we’d stop back for a peek, and ask Mom to measure us again, to see if we’d grown any after that grilled cheese sandwich and fruit cocktail. We never had. It is funny how you can not see growth but it is happening. We moved from the house after I started ninth grade. I’d have to go into our neighboring city, Bath, to go to Junior High and High School, so it was going to be an inconvenience to have to drive me each day. Nope. Buses didn’t run out to the country folk back then. If you wanted to go to school after 8th grade, you had better find a way to get there. So we moved our solidly knit family, bringing our ruler to measure and our pencil for marking. But I don’t remember any other place we got measured other than at the "cellardoor" in Woolwich. What do you think is the most beautiful word in the English language? I think this is what just happened. As the cold rains came. But I was not silent. And for that I am glad. and the sights and sounds were incredible. I would say I was intrigued by them, but I think I was more enchanted. It was such a windy day, yet warm and sunny. 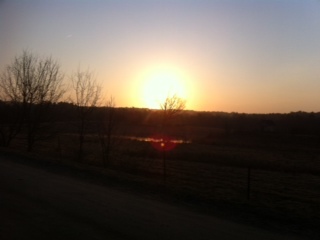 In the late afternoon my husband and I took a walk down the road. It's only a matter of time now, and the mosquitoes and ticks will be sharing the world with us. This time between dodging snow and swatting insects, between snowshoes and flipflops, is the best time for walking - as long as you can avoid the mud. You can pretty much walk in the middle of the road here. We are in a small association, so there are no cars going through and you may or may not run into a neighbor walking their dog. We saw no one. Which is nice. We could concentrate on just taking it all in as we walked. I have to say, I'm not much of a walker any more. I have a few hitches and glitches that make it uncomfortable at times, so I mostly meander. You are not going to get your heart rate up there if you're my walking buddy. But my husband was patient and we strolled and stretched our way down the road. It's a banner day. I hadn't walked this far in ages with him. I was cringing a bit though, wondering if he would have to go get the car to fetch me home again! On our way though, my attention was taken off my aches and pains and the distance, as we watched the giant pines swaying and swishing in the wind, and listened to the bare oaks rattling their branches and threatening to break - some actually sending brittle limbs crashing down to the ground. Our ears caught the happy sounds of a springtime rill heading downhill to the river. As the clear water leaped over rocks, twigs and brown leaves, I dismissed the thought of how each step away from the house was another one to return. We strolled on to the end of the cul-de-sac, the beginning of the trip back. I bent to stretch my back and ease the cramps protesting the length of the walk. I started to think about the long walk back. The car was sounding good, but I shook off the feeling, straightened up and walked on toward home. Over the howl of the wind, the unmistakable screech of a red-tailed hawk gave warning to creatures below. It's haunting, lingering screech was more chilling than the wind. We couldn't see him past the tall trees, but his presence was clear. I wouldn't have wanted to be a mouse or squirrel right then, for although we couldn't see him, I'm sure he would have seen us. I had no doubt that if I were a small animal with a sore back, I'd have still darted and jumped and scuttled under a rock to escape the piercing eyes of that hunter. As we retraced our steps, I felt the wind now at our backs, pushing us homeward. Perhaps it knew I was tired and needed the boost? Leaves skittered, popped and rolled along behind us, and then overtook us, laughing at us slowpokes as they tumbled past. They may think they won the race. But I've heard "Slow and steady wins the race." I think I won. But I hope I can walk tomorrow! Wow! I'm intrigued again! Or am I tickled? I noticed yesterday that in the past two posts I’ve used the word ‘intrigued’. I went back to my prior posts to change one of the 'intrigueds', but found I couldn’t think of a better word for it in either case. I decided that it would be intriguing to search for other ways to say I was intrigued. Voila! A poem for Friday. I guess you could call it a Dictionary Poem! How to write a "Dictionary Poem" (invented by me! ): The definition is worked in at the beginning, then a list of synonyms (at least 4) and then the antonym worked in at the end. It seemed a format that kids could use pretty easily, AND learn some vocabulary for use in other writing later. I also liked the building of the tower of words, but it doesn't have to be that way. It can depend on the word. For instance 'random' could have a whole different look! BTW: If you try it, or get your writer crew to try it, let me know! I'd love to read them and see how the format/method works in other's minds! Just comment with the poem, or where to find it online, and say "Don't post," if you just want me to read it and not publish. My comments are approved before posting, not automatically posted. 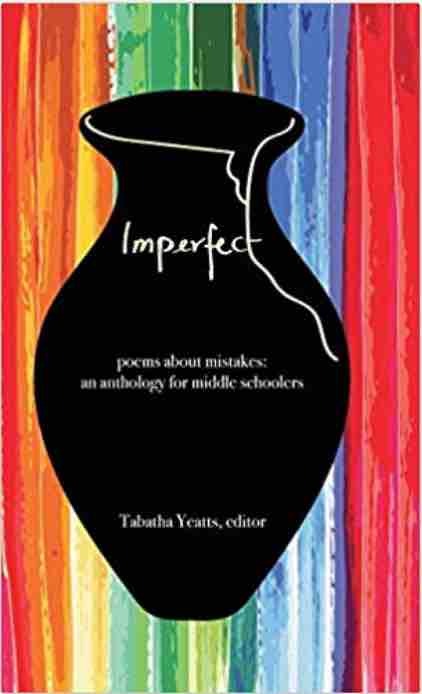 Poetry Friday is hosted today at the Gathering Books blog. Go there for some fine poetry links. As I walked from the garage to the house yesterday, I caught a glimpse of the leaves on the ground. My hands were occupied with groceries and mail, so I had to go back after putting my stuff in the house. I am always intrigued at this time of year when the oak trees finally relinquish their fall leaves. 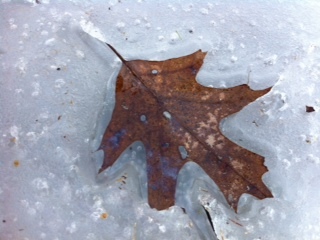 The tenacious leaves finally fall, landing on snow and ice being warmed by the new rays of a sun beefing up for its full summer power. 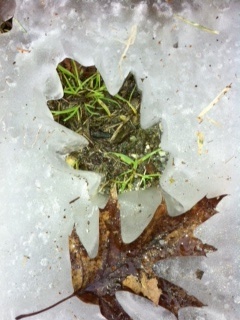 The dark leaf absorbs the sun's rays, melting the snow below it faster than its surroundings. as it sinks into the snow. As a child I imagined being able to go places that no one else could go...that were impossible for me to go. But what's impossible for me, isn't impossible for all, and that's what made it so intriguing as I thought about things as I laid in bed, sat on logs, rowed a boat, and read books. Enjoy the links. Of a very high mountain? I was doing my book chat with my daughter yesterday and we got onto other things later. One of those was the complaint that Mr. NoNap was still awake. daughter: I tried rocking him and closing my eyes (hoping he'd catch on). But every time I peeked, these big blue eyes were staring right at me. One of the times I wish my eyes had cameras. me: You don't have them yet? daughter: No, does apple sell them? me: Get it? Aye, aye, Captain! Pirates...eyepatch? Our complaint is that when a mom, a dad or a grandma wants to capture a moment it would be great to have cameras in your eyes. It is not our first conversation about this. Every time there's something cute going on, you have to drop everything and grab the camera, which is never right beside you. Your hands are often occupied with holding the cuteness. Or the cute happening is going to stop happening before you can get the camera aimed. To have the ability to blink your eyes and just start the eye camera, or iEye, as we like to call it, would be such a great invention. I'm ready to draw up the prototype. Do not steal our iDea, matey. 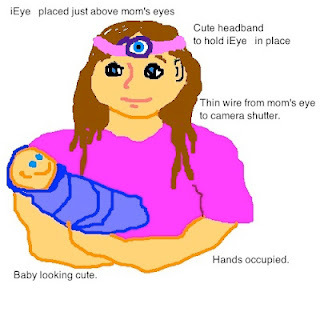 We're laying claim to the baby booty! Arrrg. I noticed some links to another challenge called It’s Monday! What Are You Reading. I am not participating, but was reminded that I am reading a technically YA book right now...and that I have taken too many days off from reading it! My daughter is going to be way ahead of me. Fortunately, with an infant in the house, it slows her down some and I can keep up most of the time. We started reading The Hobbit after a conversation in Google Chat, where I said something about "my precious". I have used that expression for years since reading The Hobbit, and thought that the creature in the caves was speaking of and to itself. She thought the creature was referring to the ring. I was surprised that she had read the book and asked her when she had read it. She said "No," she hadn't ever read it. She'd just seen the movie. I had read the book long ago, when I was in my 20's. So we decided we'd both read the book, and find out the answer in a little mother/daughter book club for two. 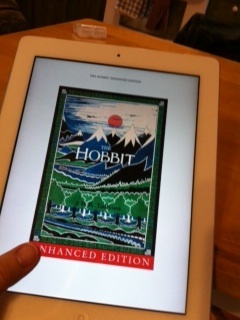 A few "chat quiet" minutes later, we had both downloaded The Hobbit. So evenings, we sit "together" and read. It's different than when I would hold her on my lap or snuggle up on the bed with those books with the golden spines, or the "chapter" books as she got older. But there is still something very special about sharing a book with your child even when they are 449 miles away, with a child of their own...and the books are on your iPads. I don't do work on Sunday. I don't have time to write on Sunday either. So it's Saturday night and I'm scheduling this to post tomorrow/today. Sunday is set aside for no work, and even when I was teaching, I made sure lessons were planned and all was set for Monday before going to bed on Saturday. Sunday is church and family. All morning. All day. All evening. I may run to the grocery store if we need some chips and dip and dessert, but mostly it is not a day for shopping either. Remember when stores were closed on Sundays? Remember when people didn't need to shop on Sunday? Didn't need to work on Sunday unless you worked at a hospital, a police station or a radio station, or were a minister? Speaking of things closed...Does anyone out there remember gas rationing and gas stations closed on Sundays? My husband and I were finishing college and had been married for a year when I got a job teaching in northern Maine. He finished grad school and then got a job in south/central Maine. They were good jobs. We were young. We could see each other on weekends. So we lived apart for the better part of a year and met halfway between our two places on Friday nights at a motel where they were giving us a good deal on a room. And we'd get a nice room at half rate for two nights. We'd arrived in different cars coming from different directions and headed back on Sunday morning going our separate ways again. Unfortunately that was the year there was a gas shortage. There were long lines at gas stations and many closed their pumps for good. Stations closed early on Saturday and didn't open again until Monday morning. On Saturday afternoon, as late as possible, we'd fill up our gas tanks for the Sunday morning rides back to our corners of the state. We each drove about 3 hours, so we had to make sure the tanks were filled. We had to find a gas station that still had gas and was open. And it had to be as close to closing as possible, other wise you couldn't drive anywhere during the day on Saturday and still be certain that you would have enough gas to get back home. It was an interesting time. We both quit our first real jobs around March and decided to live together in Wisconsin. After all, we were married. It seemed the right thing to do. My cat is quiet and no where to be found when I wake up. It’s a snowy, lazy day. The dog is anxious to start her day with a quick trip outside, then a hearty bowl of Pedigree with a side of water. No cat, until the dog goes outside. 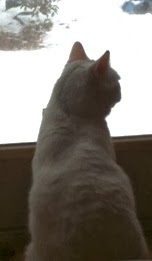 He stretches from behind the TV stand to peer out the window and watch the dog in the snow. I feed both cat and dog, and everything is peaceful, but not for long. The cat has something in mind to liven up the morning. Jump to the table, leap to the railing, squeeze through the open stair treads, bound up the stairs to the loft, run a lap around the treadmill, race down the stairs, streak through the living room, jump to the end table, hop to the half wall, sit for a second, and repeat from the beginning. The dog is on her bed waiting invisibly for the whole thing to be over.Creak. Ah, the dog's relieved. It’s going to involve me today, not her. The cat reaches to the doorknob and the door pushes open. The bedroom door wasn’t latched. Pretty soon I hear plastic rustling. The bathroom door must have been open, too. 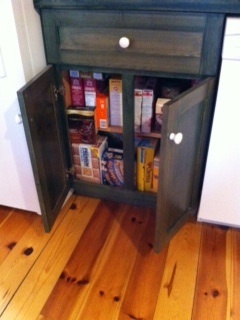 There is a trash bag in there that I am filling with expired products from the linen closet to throw away on dump day. I stride through the bedroom and into the bathroom. Yup. There he is chewing on the red handles of the trash bag. He has a plastic bag addiction. I chase him out of the room. He knows it's going to happen, so he gets to make a quick and skittery getaway. I work around the house some, and he gets on the table and looks at me. He tries to slide a stack of mail I have on the table to the floor. I yell at him. He ignores me. He starts to eat a corner of the newspaper that is with the mail. When he can’t get his plastic fix, he’ll go for crinkly paper. He’s pretty successful at getting my attention, and I shoo him off the table. He meows at me and jumps on the chair that I was sitting in before I got up to shoo him off the table. I sit in the chair anyway and he leans back a bit to avoid me. Pretty soon he leaves. He isn’t in this for the pats or the lap. I still don’t know what his game is. I think it’s just to see how irritated I can get and still feed him. I ignore the banging cupboard. It stops. I hear funny rustling noises and get up to investigate. There he is. New game. He doesn’t usually get inside and look out. He likes to watch the toilet flush, but I flush the toilet without him seeing how it was done. There are plastics in the trash, so I try to throw away trash without him seeing how the lid lifts on the trash can. If he sees it, he knows it can be done. He knows that a doorknob opens doors to other rooms, but so far they are too big for his paws to turn. 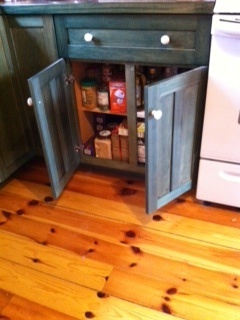 He also knows refrigerators open, but he as of this moment he’s using the wrong side of the refrigerator door. He’s trying to open it from the side with the round dot that is a hole plug in case you want to switch the direction it opens. It looks like a door knob to him, I guess. Now my railing is dusty. I was going to post on the three books that influenced my life and I even wrote some "stuff". 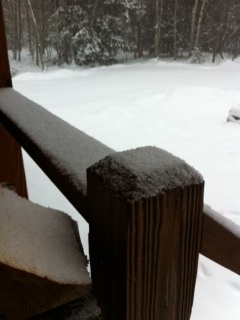 But then the snow was here out the window as I was writing, and I kept thinking about it. It's hard not to think about it when you are in a house with a sliding glass door beside the kitchen table on one hand and floor to ceiling windows to the right, in the open living room. I always get the effect of being inside an inside-out snow globe and someone has shaken the outside, or shaken something outside overhead. So haiku it is. No books.